Answer: This verse has challenged a number of people, and you can find a variety of explanations for it. I think the most important thing to note is that the verse preceding it reads, “Where, O Death, is your victory? Where, O Death, is your sting?” (1 Cor. 15:55). So the passage in reference is in the context of Christ’s Resurrection victory over death… perfect for this Easter season! So whatever we say about death we need to understand that it is a defeated enemy. So in that light, I believe that the point being made is that death would not necessarily be a fearful thing for people if it weren’t for sin. In fact death, we know from Jesus, is a doorway to New Life for the believer (John 11:11-13, 1 Thessalonians 4:13). But if a person dies in sin, rejecting the salvation of Jesus Christ, then death will have quite a “sting” – not just a sleep, but eternal death … what is sometimes called the “second death” (Revelation 2, 20, 21). However, we know that the sting of sin itself, along with death – the ultimate sting of sin – has been defeated in Christ’s crucifixion. Now when Paul refers to the “power of sin” in this verse, it is in the context of the law – God’s Law. We must keep in mind that the Law’s primary power is not to make us holy (it’s cannot) … but to drive us to the Lord. In fact, when we sin, if it were not for the law, we would be ignorant of that sin. However, the Law shows us our sin and therefore has the “power” to move us toward God for salvation. The law is a terrible taskmaster by itself; it will never be satisfied. One good thing about the the Law however, it is that when we sin, it will send us crying for mercy to the Lord. … that is one “power” that we could ascribe to sin – when we break God’s Law, it shows us our need for a Savior. I like what one commentator has said “without the law sin is not perceived; under the law sin has dominion.” … You and I would be bound to sin, and therefore the law of death, if it were not for Christ who has made us victorious over both the Law and death! Sin is merely the “grease” of both: the law and death. It’s almost like a math equation (engineer-types might appreciate this approach!) the law leads to sin, then sin leads to death. If a implies b, and b implies c, then a implies c… therefore the law leads to death. But take heart, we know even more so, the gospel of Jesus Christ leads to life! Oh thank the Lord that we are free from the law of sin and death (Romans 8:2)! In Christ our Risen and Victorious Lord! Q: I have a relative who would like to know where in the Bible it says, “God Willing.” Why do we say that when we pray? When we pray, we pray for God’s Will. Jesus both instructed us to do that in the Lord’s Prayer (Matthew 6), but He also modeled it when He prayed in the Garden of Gethsemane (Matt. 26:42). Sometimes people will say that we weaken the prayer by adding the word “if” … but Jesus, himself did it. Furthermore, we are not praying “if you can do it, God” … because we know He can do all things. What we are praying is “if it be your will” … meaning that we do not see all things like God does, and we do not presuppose to have all knowledge. It is entirely possible that God’s will is different than what we desire – we are sinful, weak and selfish. Wouldn’t it be better to receive what is God’s will, rather than the desire of our sinful heart? P.S. Praying “if it be your will, Lord” is actually similar to praying “in Jesus’ Name” … since God can’t do anything in the name of Jesus, that is contrary to His will. Does the Bible Say There’s Life After Death? Q: A loved one, who is nearing death, asked me if the Bible actually says there is life after death. Where in the Bible does it say that we will live forever after our death on earth? 1 John 5:13 is probably my favorite: “I write these things to you who believe in the name of the Son of God so that you may know that you have eternal life.” Not just because it tells of eternal life, but it gives the confidence in salvation not based on our works, but simply believing in the name of the Son of God! 31 “When the Son of Man comes in his glory, and all the angels with him, he will sit on his glorious throne. 32 All the nations will be gathered before him, and he will separate the people one from another as a shepherd separates the sheep from the goats. 33 He will put the sheep on his right and the goats on his left. 34 “Then the King will say to those on his right, ‘Come, you who are blessed by my Father; take your inheritance, the kingdom prepared for you since the creation of the world.… 41 “Then he will say to those on his left, ‘Depart from me, you who are cursed, into the eternal fire prepared for the devil and his angels. So there is much hope for the believer in eternal life, but a warning for those who do not believe in Jesus to put their trust in Him! You might ask your family member if he has been baptized, and then simply give him this promise from the Bible: “Whoever believes and is baptized will be saved” (Mark 16:16). If he believes, but doubts His faith, remind him that even weak faith isn’t no faith. And to let Jesus be his strength when he is weak. And to put his trust in Jesus. Even the thief on the cross was received into heaven with a life of sin, but a repentant heart! May God bless you as you minister to others with the clear hope from Scripture that we are promised eternal life with God through Jesus Christ! 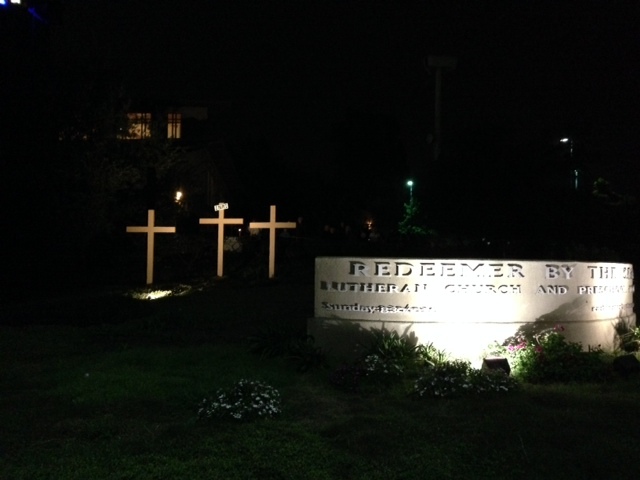 Have you seen the “crosses of Calvary” display outside our church? 5. Why just three letters? Church artists and theologians like the Trinitarian reference of just three letters. Three persons in the Godhead – Father, Son and Holy Spirit. Three letters on the cross. I’d like to leave you with these two thoughts from Max Lucado’s book, He Chose The Nails. Speaking of this sign that hung above Jesus head, he writes: “There is no person God will not use.” If you recall the criminal on the cross beside Jesus who begged Jesus to remember him when He came into His Kingdom (Luke 23:42). It is entirely likely that the criminal did not know who Jesus was, nor that He was a King, until he read that sign. God used sinful, cowardly and pagan Pontius Pilate to save a man’s soul! Pilate’s intent was likely to mock the Jews and use Jesus as a warning to others that would put themselves up against Caesar’s reign! But instead, God used Pilates actions to save someone… there is no one that God will not use. And “there is no language God will not speak,” Max Lucado writes. The sign was written in the three most prominent languages of that time. This was so that anyone who could read, could read it. God always makes sure that His message is accessible to everyone – no matter what their language! He does this through various means, but those means always point to the cross of Christ. As you and I ponder the meaning and significance of “INRI,” “IHS,” and other words associated with the cross of Christ … may we never fail to marvel at the lengths that God will go to in order to show His love for us! How do we get our nation to actually desire God again? There’s no simple answer to that question, but I fear that it will need to get worse before it gets better. I could go on and on…. but I’ll just end with a simple reminder that we are to be “salt and light” Jesus says (Matt. 5:13-16). His Kingdom does not come by sight, nor by force. We sow the seeds of the Gospel and leave the results to the Holy Spirit. In the mean time, we do not let Satan rob our peace, joy and security! Those can never be taken from us.